To save any of the materials below, just click on the file type of your choice. Click on the shortcut boxes below to jump to the section you're looking for. Follow this simple marketing guide to get the most out of your partnership with The CE Shop. You can use our suggested dates or send out on your own timeline. Regular email communication can help you maintain a strong connection with your members. Real estate agents are in constant communication with buyers, sellers, and potential clients. It makes sense to reach them where they are focusing so much of their time. By creating an email schedule and consistently reaching out to your audience, you remain relevant in their minds and their business. Emails to your members updating them on the benefits of your partnership with The CE Shop will help increase non-dues revenue. Your emails can also include new sales and promotions, upcoming member renewal dates, or reminders to take full advantage of The CE Shop courses through your partnership. These communications offer valuable tips to help your audience become more successful. Making sure your agents are up to date on the latest changes in policies is essential to their continued success. 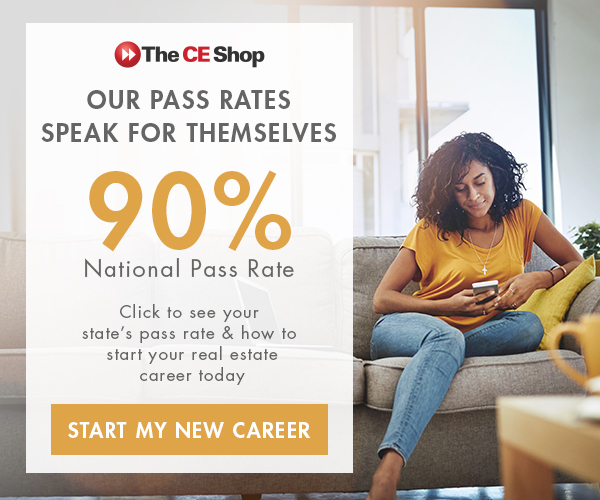 Let potential agents know that it’s easier than ever to get their real estate license with our 90% national pass rate. Are you in a one-time renewal state? If you are, remember to send out your 90-, 60- and 30-day renewal emails! Check your state’s 2019 renewal dates here. Many real estate agents log in to their various social media platforms throughout each day because it’s an effective business tool for them. Reach your current audience and get your business in front of fresh eyes by using optimized social media posts or a trending real estate hashtag. Social media platforms like Facebook and Twitter are a quick and easy way to keep in touch with your members. Make it even easier with these ready-made, plug-and-play posts. Want to master social media? Check out our handy Social Media Guide. Each month, The CE Shop features sales and promotions that will help guide your members’ buying journey. Your audience will appreciate you informing them on new ways that they can save on their education. Sharing promotions also reminds your members to make their purchases through your affiliate website. Post your monthly promotional ad to a visible spot on your webpage. Make sure you link to your affiliate site! Tired of changing posts every month? Use our automated banner ads instead! By embedding a simple HTML code on your website(s), the banners will automatically be displayed and updated with the latest promotional discounts and/or new courses available. Set the code once and our team does the rest. Questions on how to send an email? DOES YOUR STATE HAVE A SPECIFIC DATE ON WHICH ALL LICENSEES RENEW? If yes, you're in a "One-Time Renewal State." If no, it means that in your state renewals occur at any given time and you're in a "Recurring Renewal State." Questions on how to use social media for your business? The monthly cheat sheet will be published near the 1st of each month to ensure content relevancy. Only the first page of each document will change monthly. Effective language you can use anywhere on your site or in communication pieces to help increase awareness and drive enrollmments. Post these banners anywhere on your site at any time to promote specific products. Each zip folder contains the banner in a number of sizes to fit wherever you need it. Add these slides to your presentations to explain the great benefits your agents receive from your partnership. Our demo videos give you a closer look at our learning platforms and provide the user with a walkthrough of the most important features. Add them to your website or include in your marketing emails. Our training videos are a great resource for partners looking to learn how to pull reports, track students or just looking for a general refresher on how to use our systems to make the most out of your partnership benefits. please fill out the form below and your account manager will contact you shortly.